The article analyzes three recent proposals made by the State-Parties to the Framework Convention on Tobacco Control (FCTC), which appears to be relevant for determining the relationship between trade and health rules in the area of tobacco control. In this context, it attempts to answer the following questions: (i) what is the legal status of decisions made by the Conference of the Parties (COP) to the FCTC? 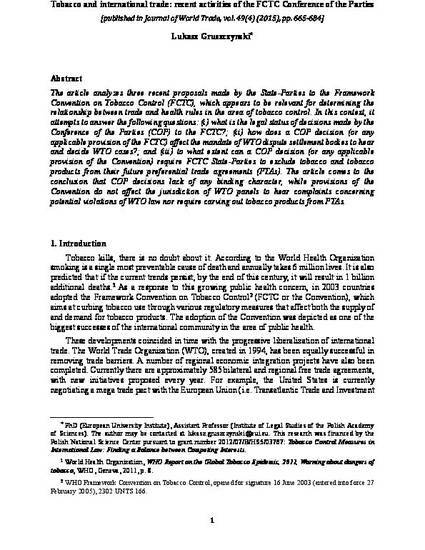 ; (ii) how does a COP decision (or any applicable provision of the FCTC) affect the mandate of WTO dispute settlement bodies to hear and decide WTO cases? ; and (iii) to what extent can a COP decision (or any applicable provision of the Convention) require FCTC State-Parties to exclude tobacco and tobacco products from their future preferential trade agreements (PTAs). The article comes to the conclusion that COP decisions lack of any binding character, while provisions of the Convention do not affect the jurisdiction of WTO panels to hear complaints concerning potential violations of WTO law nor require carving out tobacco products from PTAs.